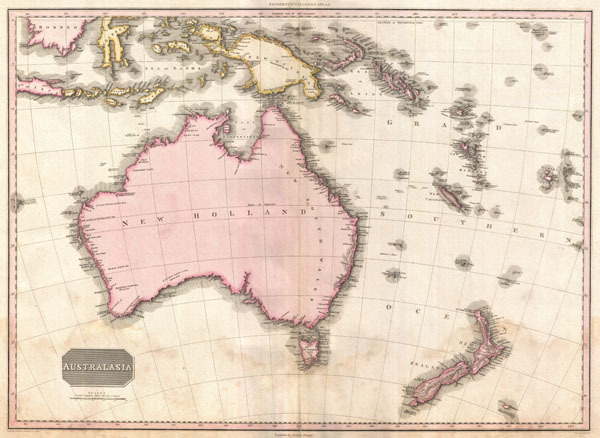 One of the most beautiful maps of Australasia to appear in the 19th century. Truly a masterwork of copperplate engraving, this is Pinkerton's extraordinary 1818 map of Australia, New Zealand and parts of the East Indies and Polynesia. Covers from Borneo south past Australia as far as Tasmania, and New Zealand. Pinkerton offers detail as he is able, but in 1808, when this map was being composed, this part of the world remained for the most part unexplored. New Guinea, New Zealand and Australia, had, around this time, been mapped only tentatively and then only their coastlines. In Southern Australia and New Guinea, even this was vague, as Pinkerton notes along the coast, 'Very Imperfectly Known.' Only two significant islands are shown for New Zealand with Rakiura Island attached to the mainland. All around Australia, Pinkerton offers copious notations regarding the activities of various exploring missions to the region, including P. Nuyt, Dinnings, Edels, C. F. De Witt, Esdracht, Dampier, Van Diemen, and others. In Polynesia the New Hebrides, New Caledonia, Fiji , Queen Charlottes Archipelago, and the Solomon Islands are identified. For the most part, the interiors of all the lands herein depicted are unknown and consequently left blank. Possibly the finest mapping of the region to appear in the first years 19th century. Very good condition. Light spotting in lower quadrants. Blank on verso. Platemark visible. Rumsey 0732.040. Phillips (Atlases) 724. National Maritime Museum, 409.